There's precious treasure on the sea bed, but the giant Octopus doesn't want you to have any. Avoid its tentacles and retrieve as much treasure as you can. Move the diver down the rope and across the sea bed, dodging the tentacles of the Octopus. When the diver reaches the treasure, press the button to put gems into the bag. You score 1 point for every gem you collect, and 3 points for returning to the boat with treasure. 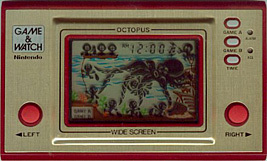 The Octopus's tentacles move faster as you play. Dodge the Octopus's tentacles and reclaim the treasure. The Octopus's tentacles move faster than in Game A.